For starters, it’s a strange place for kids to be enjoying their solitude. But as a work of sculpture what Dietrech Wegner has created is a marvel to behold. 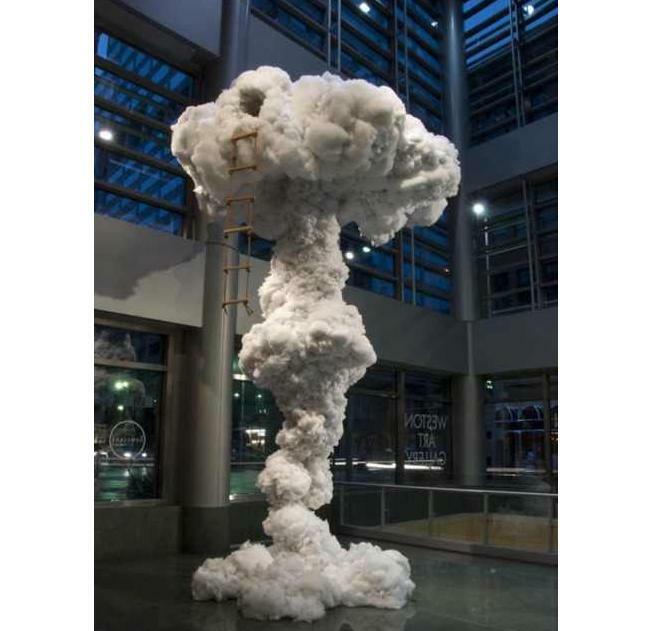 A study in balancing lightweight materials with aesthetic sensibilities, the mushroom cloud tree house is an eccentric take on a boyhood institution, not to mention a towering display of nuclear might. Further investigation has revealed that the artist’s message was to pose a contradiction. We’re not going to delve into the philosophical underpinnings here or whatever. Bottom line is it’s a nice sculpture, though we’d love to see a lengthier ladder up to its entrance. The sculptor, of whom little is known, has inadvertently stoked our enthusiasm for post-nuclear imaginings along the lines of Fallout 3. Mr. Wegner’s sculpture has gone viral thru that endlessly entertaining repository of silliness, Reddit where it has garnered a relatively enthusiastic reception. Dietrich Wegner’s latest creation is currently live and on exhibit at the Weston Art Gallery, Cincinnati.